Want to know how to plan the best night of the summer? It’s coming up soon but you have to move fast. Skyline Cruises is once again hosting one of our most popular trips of the year. 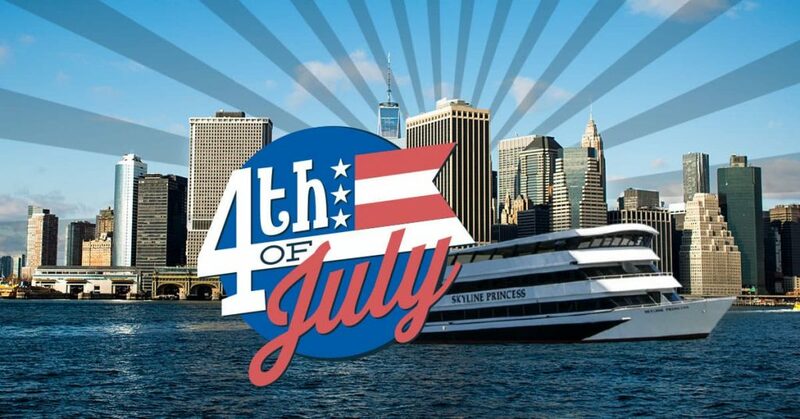 Our annual 4th of July Fireworks Dinner Cruise will depart at 6 p.m. on Independence Day. If you’ve never been on this exciting holiday cruise you’re missing the most spectacular view of the world-famous Macy’s Fireworks display. Nobody gets you closer to the show that our 3-deck cruise ship the Skyline Princess. Whether you’re celebrating a holiday for everyone like July 4th or New Year’s Eve, or if you’re planning a personal event like a birthday, Bar/Bat Mitzvah or a wedding anniversary. Skyline Cruises will do corporate events and we’re one of the most sought-after wedding venues in the tri-state area. We work with all types of people and groups and we help you celebrate events large and small. We’ll work with your group and your budget. We offer full ship charters from ports all over the area such as Long Island, Westchester, Connecticut and New Jersey. All of our public cruises like the 4th of July cruise, leave from our home port at the World’s Fair Marina in Flushing, Queens. For smaller events that don’t require a full ship charter, we’ll rent a private deck or a few tables. Some of our smallest weddings involve just a handful of people. Tell us what you’re looking for and we’ll try to accommodate. One way we accommodate our customers on July 4th is by giving you a cruise that’s even longer than our usual trips, which are already longer than our competition. Your five-hour trip will leave from the World’s Fair Marina, where there’s always free parking for Skyline customers at 6 p.m.
You’ll cruise the East River, where you’ll go past iconic sights such as the Empire State Building, United Nations, Chrysler Building and 1 World Trade Center. Like all of our New York City cruises, you’ll get a close-up view of the Statue of Liberty. But the East River is where the action will be. According to BusinessWire, this year’s show will use more than 75,000 shells and effects. And you’ll have a unique view. You’ll also have a dinner buffet, dessert and a dance floor and DJ. Worried about the weather? Don’t be. The Skyline Princess is climate controlled and launches all year round. We’ll give you plenty of views of the fireworks as there are viewing areas on all three decks. Our top deck, called the skyline deck can be enclosed or open air as the fireworks light up the sky. If you’re ready to celebrate America’s 242nd birthday and want the fun and pageantry that July 4th is known for, book your spot on our fireworks cruise right now. But don’t delay. This event always sells out. To learn more, contact Skyline today.